Every year, we ask the global community to help shape a timely and outcome-oriented RightsCon program. The sessions we receive through our call for proposals – which ran from Oct. 23 to Dec. 19 – offer insight into the work currently being done for human rights, as well as provide direction for our future efforts. 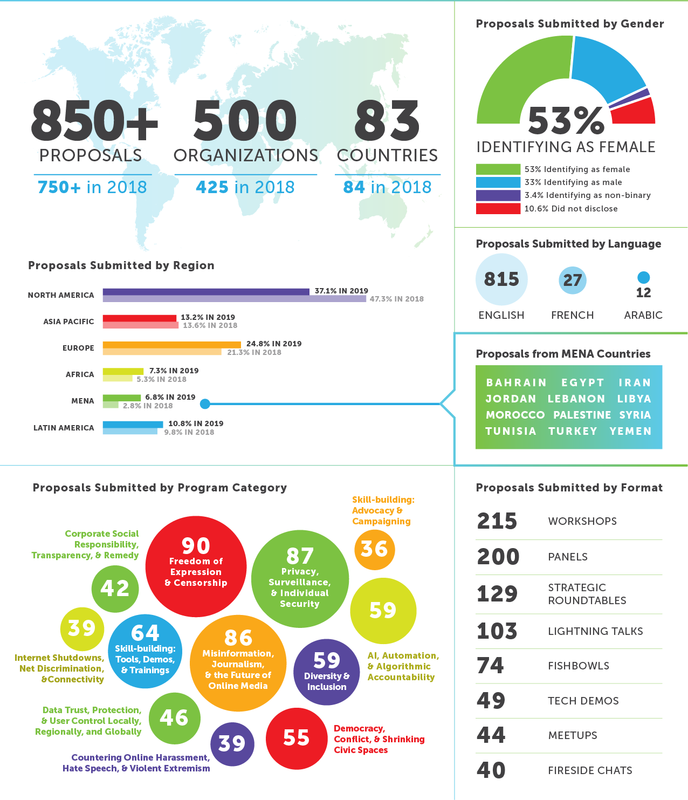 The RightsCon Tunis (June 11-14, 2019) call for proposals showed us the growing relevance of our collective work with more than 850 proposals from 83 countries. We’re excited to share that the participation of organizations from the MENA and Africa region doubled from last year, and the trend of women leadership at RightsCon continues, with over 53% of the proposals coming from people self-identified as women. There was an increase in the traditional most submitted-to categories – freedom of expression and censorship; privacy, surveillance, and individual security; and misinformation, journalism, and the future of online media – confirming that these are pressing challenges that societies continue to grapple with around the world. We’re also seeing expansion in newer issue areas, including the impact of technology on the sustainable development goals, the environment, and humanitarian crisis response, solidifying the trend transitioning from digital rights to human rights in the digital age. See a snapshot of the proposal results below and download our full stats breakdown here to get a sense of who’s contributing to our most timely, vital, and compelling program to date. Over the next several weeks, we’ll be hard at work alongside our Program Committee to review each and every proposal. Together, based on your submissions, we’re building a global agenda for our human rights in 2019 and beyond. If you submitted a session, you can expect to hear from us by the end of February. As an emerging tech hub and growing democracy, Tunis provides a welcoming platform for civil society, technologists, businesses, startups, public servants, and lawyers to realize the agenda you’ve created and move forward real-world change. According to a recent New York Times article, “freedom is what makes Tunis unique” and we couldn’t agree more. This will be an experience you won’t want to miss and with many opportunities to get involved, there’s a way for everyone to join the RightsCon community. Get your ticket. First and foremost, attending RightsCon allows you to learn from leading experts, connect with our global community, and build partnerships to further your work. As a participant at RightsCon, you won’t be just a passive attendee. Our interactive and outcome-oriented sessions allow you to play an important role in shaping the global agenda on human rights in the digital age. Act now and you can still take advantage of our Early Bird pricing! Participate. Hosting a session isn’t the only way to get involved at RightsCon. Join us as a volunteer or cover RightsCon as a member of the press. Over the next few weeks, we’ll be launching our Community Village exhibition space, applications to speak about your work or research on selected program sessions, our Young Leaders Summit satellite event, and much more. Sign up for our newsletter to stay up to date. Sponsor. Investing in RightsCon is a mutually beneficial opportunity to support our global community’s growth and build your organization or business’s brand. Being a sponsor offers a unique opportunity to engage deeply and effectively with hundreds of the world’s leading experts and influencers. We also work with potential sponsors to craft a partnership that works best for you, whether through our pre-made packages or by selecting from a la carte or in-kind sponsorship opportunities. We’re deepening our efforts in guiding session excellence and furthering our commitment to outcomes for RightsCon Tunis. To that end, this year’s program will feature important updates – space for problem-solving sessions, simultaneous-translation in Arabic and French for selected sessions, skill-building tracks, and more – all in an effort to deliver a more diverse, navigable, and high-quality program. Questions? Get in touch with us at [email protected] and we can help you build your perfect RightsCon experience.